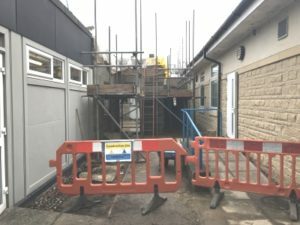 A new extension at Witney Community Hospital is being built to create a more comfortable environment for people visiting the minor injuries unit, X-ray and outpatients departments. A new 24-seat waiting area is being constructed in a single-storey extension on hospital land attached to the X-ray department. It means people waiting for X-rays and outpatient clinics will have a dedicated space away from the minor injuries waiting area which has seating for 34 people. The extension, which should be complete by the end of March, has also resulted in the creation of a new consulting room plus new changing rooms and toilet facilities – all providing better comfort and privacy and helping to speed up appointments. Witney Community Hospital, off Welch Way, is run by Oxford Health NHS Foundation Trust. It provides rehabilitation and palliative care for people who no longer require the services of an acute hospital but require greater support than currently provided in their home environment. In addition to its inpatient beds on Wenrisc and Linfoot wards, the hospital has a busy minor injuries unit (MIU) which sees on average more than 1,000 patients a month, and a GP out-of-hours base which cared for 8,156 patients last year. It also has an emergency multidisciplinary unit (EMU), X-ray facilities and a range of outpatient clinics. The hospital also runs 32 separate clinics each week, covering a myriad of services including hearing aid and audiology, ophthalmology, geratology, paediatrics, orthopaedics, neurology, gynaecology, midwives and mental health. All patients including MIU, X-ray and outpatients currently use the main waiting area to the left of reception. 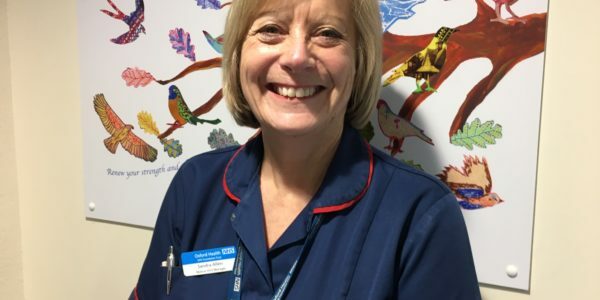 Sandra Allen, pictured, Matron of Witney Community Hospital, said: “We are delighted that we will soon be able to offer people a much more comfortable time while they wait to be seen by our staff. Witney Minor Injuries Unit is open from 10am – 10.30pm, Monday to Sunday. You can go there if you have an injury like cuts and grazes, sprains and strains, broken bones (fractures), bites and stings, minor eye infections and scratches. You will get seen quicker at an MIU than going to the emergency department at the John Radcliffe or Horton General hospitals. A&E staff there must give priority to serious and life-threatening conditions. You can make an appointment for our MIUs by calling the NHS 111 service or walk in; you will have the option to wait for an available appointment or return at a later time for an appointment slot. They are run by a team of highly qualified nurse practitioners with a lot of experience and expertise in the treatment of minor injuries.